The challenge of new experiences motivated Maude Frazier. It led her to attend college over her father’s objections. It brought her west as a young woman to teach in small Nevada towns. It motivated her to seek greater responsibilities as an educator, school supervisor, and a state legislator. Frazier looked at the wide and empty spaces in Nevada and saw opportunities to expand education for southern Nevadans. Frazier grew up in a farming family in rural Wisconsin and taught in a mining camp in the state. But in 1906, stories of teaching opportunities in the West led her to a job in Genoa, Nevada, teaching in a two-room schoolhouse and to other small schools across the state. 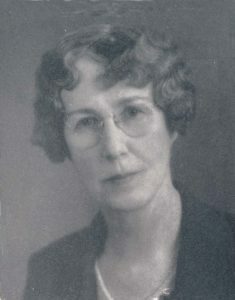 Her diverse experiences served as her best reference for the position of Deputy State Superintendent of Schools in 1921. She said of her selection over several competitors, “I was well aware that when a woman takes over work done by a man, she has to do it better, has more of it to do, and usually for less pay.” Her region comprised about one-third of the state and had few developed roads. Frazier recruited and supervised teachers for the remote schools. She coordinated sixty-three different school districts and helped them develop school budgets and revenues. The challenges of school financing and enormous growth were part of Frazier’s next job as Las Vegas Superintendent of Schools. From 1927 until leaving the job in 1946, Frazier took the lead to build new schools, secure public funds, and promote the idea of revenue equalization for children in the southern part of the state. Frustrated with the obstacles she witnessed, Frazier ran for the State Assembly and won her second campaign in 1950. She served twelve years during which time she shepherded legislation that reorganized the fragmented state school system and raised attention to the need for a junior college in southern Nevada. She secured state funds and matched them with private donations to build the first buildings. The school, later renamed the University of Nevada, Las Vegas, honored her by naming its first building after her. Frazier continued to break new trails right up to her death. At the age of 81, Governor Grant Sawyer appointed her interim lieutenant governor in 1962, the highest state-level position ever held by a woman in Nevada. For further biographical information: Maude Frazier papers. Nevada Women’s Archives. Special Collections, UNLV. Collection number x30. “Maude Frazier.” 1999. The first 100: Portraits of the Men and Women who Shaped Las Vegas. Edited by A.D. Hopkins and K.J. Evans. Huntington Press. Pp. 80-83.